If there is one thing that I’m not a big fan of, it is decorating. As we built our home, my main focus was to make the finish work beautiful, so I didn’t have to add too much decoration! I don’t like to buy expensive decorations, and I don’t take time to make adorable crafts. 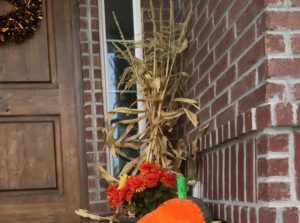 My boys are the ones dragging out Halloween and Christmas decorations before I even think about getting them out. When we pass houses with adorable decorations, all I hear is how “AWESOME” their house is! That said, the decorations and crafts that I post on my blog will be simple and easy. Here are 3 different ideas that are crazy easy, and cheap! YEP! My favorite kind of crafts! Most of the stuff you need is laying around your yard OR close by in someone else’s yard. or I like to use a tomato cage for stability. There are 2 ways to use your tomato cage. 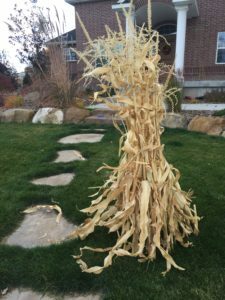 If you want a free standing corn stalk decoration on your lawn, you can poke the tomato cage in the grass for a sturdy base, and place your stalks around the cage and wrap it with string. 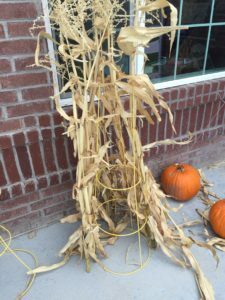 If you want it on your porch, you can turn the cage upside down, place the stalks around the cage and tie a string around to secure the stalks. This stand helps your cornstalks to stay standing up through windy days. It works really well! Please tell me you feel the same about those cotton spider webs! Trying to reuse those bad boys every year is a pain. The time it takes to spread it out and make it look good is not my favorite thing to do! I got this idea from a friend of mine and loved it! It is adorable, eye catching, cheap and easy! I used bailing twine for mine. You can use any kind of rope. The thicker the rope the more it will stand out. This rope on amazon would look Amazing!! Cut 8 strings (or as many as you want) the desired length. 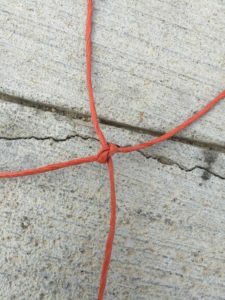 Tie a knot on one end, combining all of the strings. 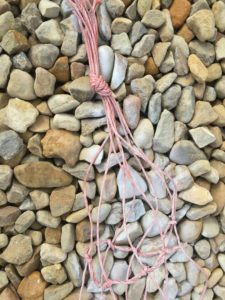 Tie each end to a rock and stretch them out. Next, lay down your other set of strings as you want them. No go through and mark with a marker on each intersection, and go back and tie a knot. I spray painted mine white. 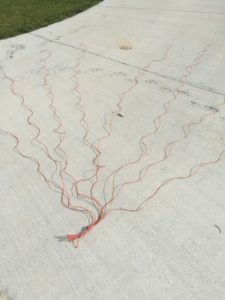 My house is red brick and the bailing twine got lost in my house. You can spray paint it or just paint brush on some white paint. Hang it up and attach the bottom ends to something heavy. 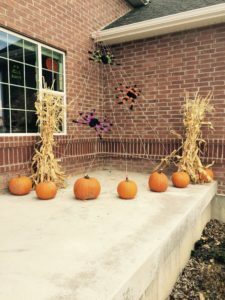 I attached mine to some pumpkins. 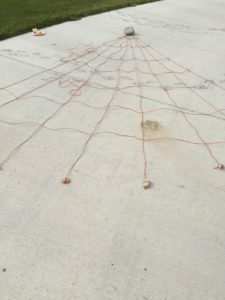 My friend attached hers to spikes in the grass…..add some spiders and you have yourself a cute spider web you can use over and over again!! These are so cute and so easy! 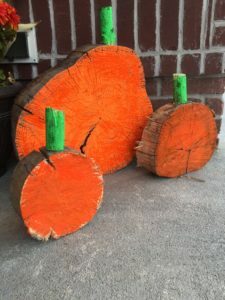 Have your husband or someone cut some slices of different sizes of logs. 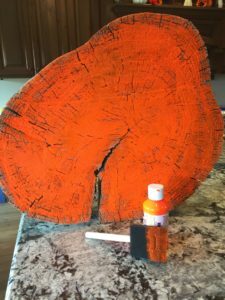 Get some bright florescent orange paint like this one . You can use any orange paint but florescent orange makes it really stand out!! 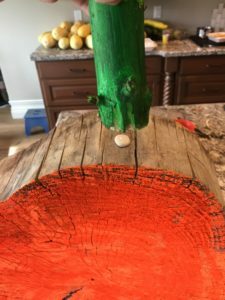 Paint and glue a green stem on the painted pumpkin. I used this Gorilla Wood Glue! Works Great! Make three of them each a different size! Super easy and really cute! I get a lot of compliments on these! 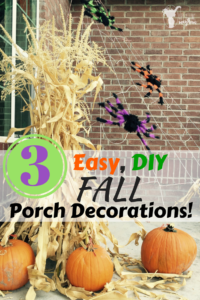 You put all three of these together, you have your porch decorated, and happier kids who think their yard is AWESOME!! LOLOLOL!!! 11 Bits and Pieces that EVERY NEW Mother will Benefit From.